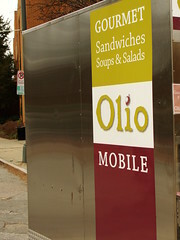 Olio Food Cart offers gourmet sandwiches at affordable prices. They source their ingredients from local farmers whenever possible and accept all major credit cards. They are located at the intersection of Linden and Grove M-F 11a-4p. Check their facebook page for location updates.